The parts kit has been discontinued by GM long ago. 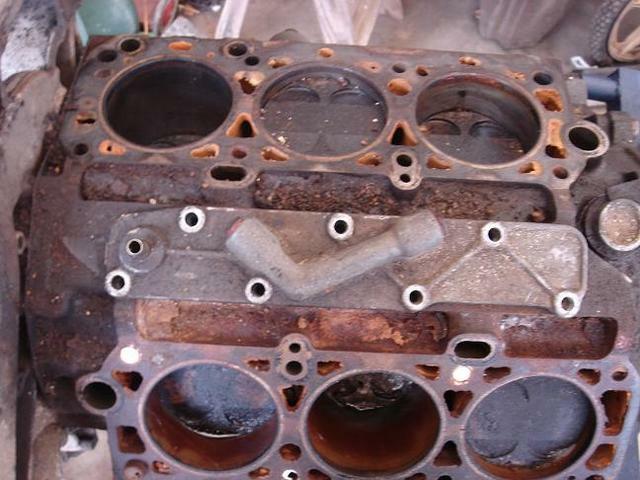 My quest was to find sources for those parts; and complete the procedure on my '93 Lumina Euro 3.4 which was torn apart to replace the rear head gasket. There are three critical part numbers in the GM service kit (aside from gaskets and O-rings) required to perform this operation. Two of the three are readily available in the aftermarket--the 10-32 set screws, and the cup plugs. I hadda buy a box of cup plugs and a batch of set screws; if you can't find 'em locally, send me a PM. All gaskets 'n' seals are readily available, and are included in the gasket set I needed to replace the head gaskets (Fel-Pro HS9113PT1 Head Set.) This leaves one item that is expensive to source--the replacement thrust plates. Reading the bulletin, and seeing the cam carrier gave me a clear understanding of how to proceed. Note that in some of my photos, the thrust plate is UPSIDE DOWN. I intended to leave the camshaft positioning tool in place while servicing the camshafts, and the thrust plate was in the way to drill the front camshaft. I re-positioned the thrust plate--but the drill bit wasn't long enough, and I had to remove the positioning tool so I could rotate the camshaft and drill straight down instead of at an angle. The thrust plate should be left in position, otherwise as soon as you start to install the cup plugs, you'll knock the camshaft out of the cam carrier. Assure that all the metal chips have been removed from the camshafts. I used a nylon brush and aerosol carb spray, finishing with compressed air. The brush I used has four or five inches of bristles, the hole in the cam is not deep enough to get all the bristles inside. This is REALLY EASY when the cam carrier is "on the bench". It would be much more time-consuming with the cam carrier on the engine. Drill hole in cup plug small enough that a sturdy sheet-metal or wood screw threads in. Pry out cup plug. Mine came out surprisingly easy. They did not appear to have any sealer. Once the end of the camshaft is opened up, install brush (not shown, yet), and drill the 4mm hole with a #21 drill bit. Tap hole for 10-32. Do not tap all the way through. Tap only deep enough so the set screw will go just below flush with the camshaft surface. Set screw therefore CANNOT POSSIBLY vibrate deeper into the hole and come out the other side. File the burr at the top of the hole. Clean the hole, remove brush (not shown) to pull chips out of camshaft. Aerosol solvent and compressed air assure no chips remain. Set screw is driven into place using thread locker to assure it won't vibrate out-of-position. Original 4mm hole is now plugged. First cup plug driven into place in right side camshaft, using thread locker as sealant. A #22 bit will fit into the 4mm oil hole, shown in left camshaft, provides visual confirmation of exact drilling angle. As said earlier, I had to rotate the left camshaft so the oil hole was "straight up"; but I don't have a photo of that. Drill that hole with a #21 bit, tap, file, clean up the chips just as was done with first camshaft. The oil holes in the camshaft cup plugs fill the cover plate with two pools of oil. The end of the cams are bathed in this oil, and that's what lubes the thrust plate instead of having the plate sprayed directly by the original oil hole as the cam rotates. The new camshaft thrust plates (I bought ONE; $30 at the dealership) are exactly like the originals--except they are .0025 thinner by my measurement. No problem, you say. Take the originals, put a piece of solvent-wetted sandpaper on a glass plate (for flatness) and sand off two-and-a-half thousandths. Use a 0-to-1 micrometer in several places on the thrust plate to gauge how much material you're taking off, and to assure it's coming off evenly across the whole plate. Pack a lunch. You'll be there all day. The thrust plates are hard as hell. My arm wore out and I've only rubbed half-a-thousandth off. A local machine shop wants $21 apiece to surface-grind these things down. The thrust plates are discontinued from GM, so milling originals will soon be the only way to go. Surface grinding the thrust plates makes the oil grooves shallower, after the photo was taken I used a Dremel with a cutoff wheel to grind the grooves a bit deeper. I don't expect any problems here. Several people have talked about the possibility to use the 3.4 DOHC heads on the 3x00 engines. 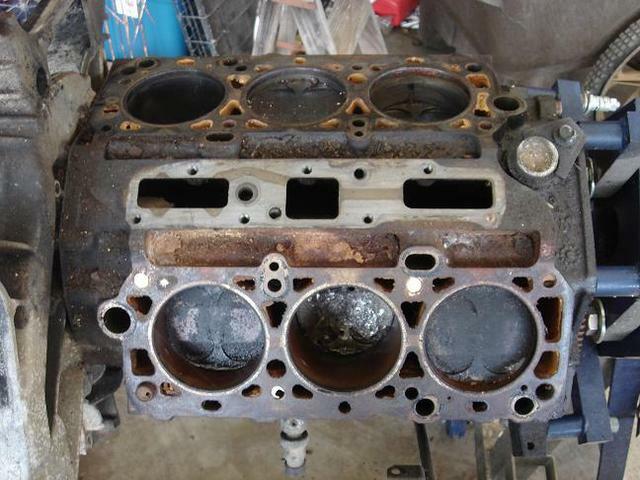 Some for performance, and some for replacment, where getting a 3.4 DOHC block might be difficult, but getting a 3400 (or even a 3100) block might be easier to come by. For these test fittings, I used a 1994 3.4 DOHC BLOCK, a 1994 3.4 DOHC REAR head, a 1999 3100 SFI BLOCK, and a 1996 3100 SFI head. This article is broken into 3 sections. The first section is BASIC COMPARISONS where I compare the BLOCK of the 1994 3.4 DOHC, and the 1999 3100 SFI. 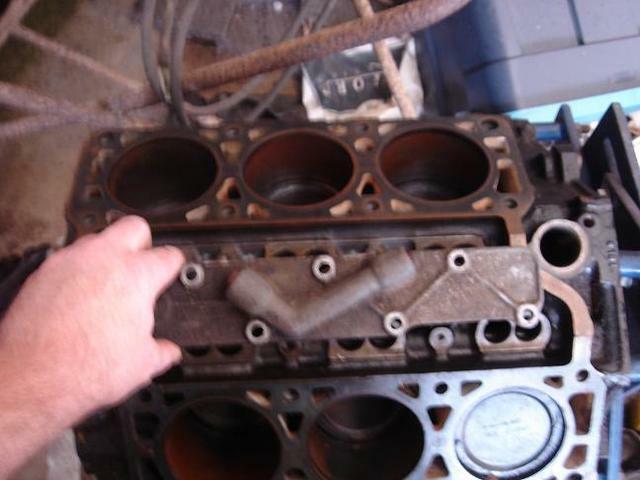 The second section is a 1994 3.4 DOHC head on a 1999 3100 SFI block. 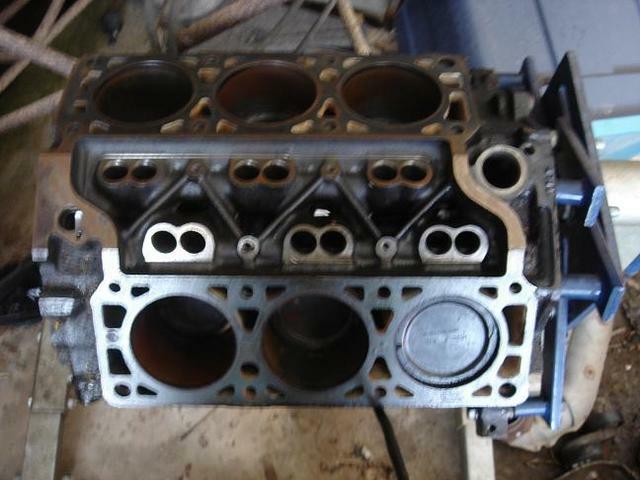 The third section is a 1996 3100 SFI head on a 1994 3.4 DOHC block. This is the BASIC COMPARISONS between the 1994 3.4 DOHC, and the 1999 3100 SFI. One of the biggest NOTICEABLE differences is the OIL VALLEY. The 3.4 DOHC does not have lifter holes, and it has a cover on it. When the engine is ASSEMBELED, the valley is actually OPEN to the air, and not sealed off like the 3100. The 3.4 DOHC has that cover on it to keep anything from getting in there. Here is the TRW catalogue spec sheet for the 91-95 as well as the 96/97 pistons.